The CleanFinancial.com guide to spread betting on the NFP. The Downside of Trading the NFP Market? How to Spread Bet on the Nonfarm Payroll? What is the Nonfarm Payroll (NFP)? Where to Find the Market? Finally a number of firms are offering a spread betting market on the monthly US nonfarm payrolls release. Here we take a look at how and where to trade it. Editor's comment: Other firms may also offer this market but we've not seen many offering it yet. 02-Jul-15 [12:32pm] Will the NFP Hit 233,000 New Jobs? The key jobs figure for February added 295,000 jobs to the US economy, with the unemployment rate dropping to 5.5%. This was significantly higher than the MarketWatch expectation for a figure of 238,000, suggesting a strong jobs market. After Mario Draghi provided some details of the ECB's QE programme yesterday, attention now turns to the US economy. Today's Nonfarm Payrolls report will be a major influence on trader expectations for the Fed's first rate hike. The MarketWatch forecast is for a rise of 238,000 jobs but Financial Spreads does not seem to be quite as optimistic. Their NFP market is currently priced at 232.5 - 237.5, representing a gain of between 232,500 and 237,500 jobs. The US unemployment report for January has revealed 257,000 jobs were added to the economy, with the unemployment rate shifting slightly to 5.7%. This was ahead of the MarketWatch expectation for a figure of 230,000. Following a dovish set of FOMC minutes, the market is now turning its attention to the Nonfarm Payrolls report to see how US unemployment is faring in the run up to an expected rate hike later this year. Current expectations from MarketWatch is for the US economy to have gained 230,000 jobs. However, Financial Spreads seems to be a little more bullish, with their NFP market priced at 237.5 - 242.5, representing a gain of between 237,500 and 242,500 jobs. We will find out who is right tomorrow afternoon. With significant moves in commodities impacting markets across the globe, the US NFP remains an incredibly important data point for investors. This month, the FinancialSpreads NFP market is priced at 225.0 - 235.0, where each point represents 1,000 jobs. Interestingly, the MarketWatch forecast is at the very top end of that range at 235,000. Ahead of last month's figure, analyst expectations were almost identical to this but the number ultimately came in at just 214,000. Are we set for another disappointment? We have seen a slightly below expectations rise in the US Nonfarm Payrolls report, with the October figure adding just 214,000 jobs. However, this was the ninth consecutive month to add more than 200,000 postions and the unemployment rate surprised by coming in lower than forecast at 5.8%. Will the October 2014 NFP Beat the 220k Expectations? With Wednesday's ADP jobs data pointing towards a strong gain in US employment, IG talks to Marc Ostwald from ADM Investor Services about whether the Nonfarm Payrolls forecast of 220,000 jobs may be too conservative. 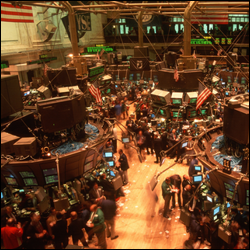 Following several weeks of volatility across the financial markets, traders' attention now turns to the October NFP. Looking at the Financial Spreads Nonfarm Payrolls market, the firm is currently quoting 230.0 - 240.0, suggesting that the US economy will have added between 230,000 and 240,000 jobs during October. This ties in nicely with the MarketWatch forecast of 235,000 jobs, but it's interesting that the spread betting firm felt the need to increase their spread from 5 points last month to 10 points. I've checked with rival Capital Spreads and they have also upped their spread by the same amount; perhaps the various spread firms took a larger than expected hit last time? Perhaps buyers of the Nonfarms market will have regained some faith after last month's miss, with 248,000 jobs added in September, above the 216k many were expecting. The Nonfarms market has been trading a little lower over the last 3 days and is now priced at 212.5 - 217.5, i.e. suggesting 212.5k to 217.5k new US jobs in September. With stocks falling for the last few weeks, it looks like the NFP expectations have also been coming down. The FTSE 100 hit 6899 on 19 Sep and since then it has tumbled a solid 500pts lower. On 5 Sep, just before the previous NFP data was released, the CFD and spread betting markets were traded at 228.5 - 233.5. Is the NFP reflecting the nervous-looking stock markets rather than the fundamentals? Given that the last two readings were 142k (5 Sep) and 209k (1 Aug), is the market still too high? We will see at 1:30pm today. It's that time of the month again as we look towards the key US unemployment data for the month of September. Following August's surprisingly low figure of just 142k, the September forecasts are targeting a gain of 220,000 jobs according to MarketWatch.com. Currently, the FinancialSpreads NFP market seems to concur, with a spread of 216.5 - 221.5, i.e. expecting between 216.5k and 221.5k jobs. It's not been a good NFP for buyers, with expectations at 230,000, a final figure of 142,000 is quite a miss. Finally, some movement in the NFP market. On 1 Sep the spread betting market was trading at 212.5 - 217.5, it's now seen a healthy jump higher to 228.5 - 233.5. These Nonfarm markets have been running since May but we've not really seen these kind of shifts before. I'd hazard a guess that investors are much happier trading this market now that it's down to a 5pt spread. And, unlike an FX or Index trade, with nowhere for the spreads companies to hedge off their positions, any large trades could easily see them move this market. Elsewhere, MarketWatch were predicting 226k jobs on 1 Sep, that's now moved slightly higher to 228k. It's time for the August nonfarm payroll report which comes out this Friday (5 Sep). For those who like trading this market there is some good news, the spread betting firms have cut the spread to 5pts. The May NFP market started off with a largely untradeable 30pt spread but for the June NFP market it was trimmed down to 10pts. This suggests that there will be 212.5k - 217.5k new jobs in August. Note that MarketWatch is currently forecasting 226k new jobs. Looking at the Nonfarm market for July, i.e. 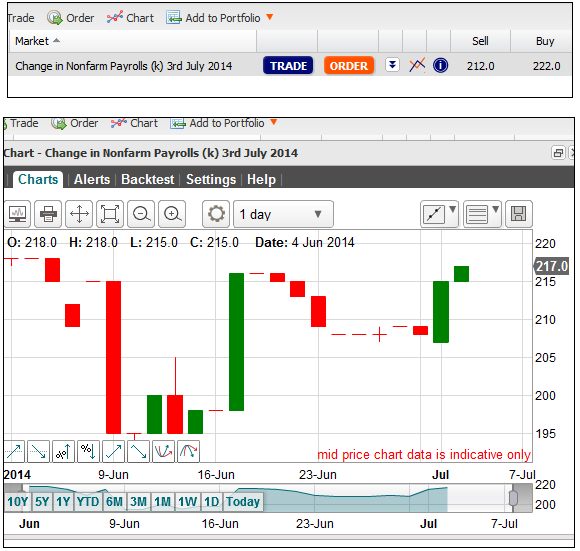 the release on Friday 1 August, FinancialSpreads are currently quoting a spread of 230 to 240, i.e. they are expecting an NFP reading of 230k - 240k. The latest forecast according to MarketWatch.com is 230k. It's good to see that the forecast was way off as we discussed this morning and Michael Hewson of CMC suggested yesterday (see below). The forecast was for 215k and the jobs data came in at 288k. Yesterday the financial spread betting market was trading around the 212 - 222 area for most of the day. Naturally the market was settled at 288 and so there was a cheeky 66pt profit for the buyers (and a 76pt loss for sellers). Let's hope the companies running the market didn't lose too much so they run the market again next month. We often read how the analysts get it wrong so I thought I'd take a quick look at the 'consensus' predictions for March 2007 to June 2014. In short, the 'total' consensus for the period was 2,574,890 new jobs which overestimated the actual number of 2,085,000 by 489,890. Put another way, the forecast was slightly too optimistic by an average of just 5,600 jobs per month. If we narrow that down to the last 12 months, the 'total' estimate for the period was 2,172,000 new jobs. That only underestimated the actual number of 2,192,000 by 1,667 per month. So over time the predictions are surprisingly accurate and not worth trading. But we're not looking to trade the 'totals' over time, we're trading individual months. The typical deviation, either positive or negative, for a given month? Sadly, from a trading point of view, the spread betting market isn't moving much and it will be settled on the actual number. Otherwise you'd make 2 large opposing trades with tight guaranteed stops on both. Having said that, to avoid the inevitable argument with their clients I can see that the spread firms won't let you add guaranteed stops on the NFP market. (note the above data doesn't include corrections to prior readings). Nice to see that Financial Spreads (and Cap Spreads) have finally tightened their Nonfarms market from a 30pt spread to a 10pt spread. OK, I agree with you. A 10pt spread is certainly not a tight spread. But it's certainly more tradable than it was. The current market is at 212 - 222 and, looking at the chart below, the market has only traded a 25pt range over the last month. According to MarketWatch the consensus forecast is putting us at 215,000 jobs in June. It seems that the spreads firms are currently expecting a minor change for the next NFP number. The data is normally released on the first Friday of the month however the June nonfarms report will come out a day early, i.e. on Thursday 3 July. This is because our cousins on the other side of the Atlantic like to celebrate their independence. Why they wouldn't want to be ruled by Sir David Cameron is beyond me. Both FinancialSpreads and CapitalSpreads have the market at 193 - 223, i.e. they are predicting 193k - 223k new jobs. So with a mid-point of 208k that's only a 9k change on last month. Surely this market can't become as calm and boring as all the other markets. The NFP for May came in at 217,000. Therefore the NFP spread betting market was settled at 217. This is a good example of where wide spreads are bad for investors. How did it work? The market opened at 200-230 which meant that you could buy at 230 or short the market at 200. Again, with a £2 per point spread bet, if you sold at 200 you also would have made a loss. The key reason why both the buy and sell trades lost is the large 30 point spread (NFP predictions are rarely that accurate). Normally the firms offering this market offer a 1 point spread on markets like the FTSE and EUR/USD so you probably don't notice the cost. That's why we like tight spreads. With a 30 point spread you can see the difference, it's more likely that the market will close inside the spread, i.e. where both buyers and sellers end up losing. 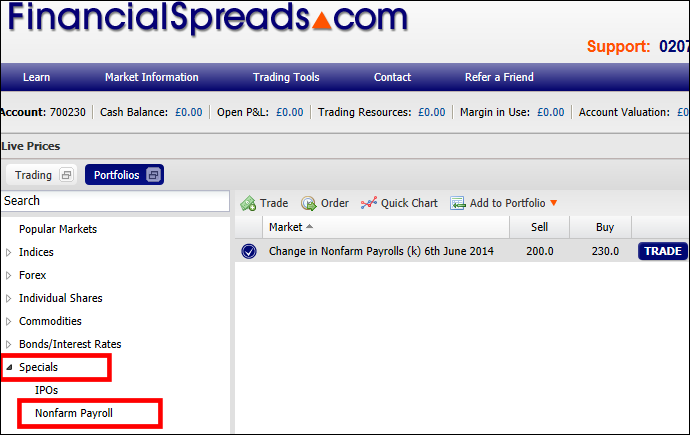 Hopefully we'll get a tighter spread for the June 2014 nonfarm payroll spread betting market. In this monthly trading seminar, Jasper Lawler talks about expectations for May's NFP numbers in the lead up to the event and the reaction of key financial markets in the immediate aftermath of the release itself. The NFP market has moved back to 200-230, i.e. perfectly spanning the predicted 215,000 new jobs. Hopefully we'll get a tighter spread next month and see if a few of the more astute trades are happy to push the market around. There's been a small move in the NFP market this morning after yesterday's US employment update disappointed. The pressure is ever so slightly to the downside. The market has moved from 200-230 to 197-227. It's a wide spread but FinancialSpreads have opened the bidding at 200,000 to 230,000 new jobs in May. I.e. their market is at 200 - 230. The April NFP release came in at a whopping 288,000 when the consensus was predicting 210,000 jobs. For May, the consensus is for 218,000 new jobs. The unemployment rate is expected to rise to 6.4% from 6.3%. Above, a Bloombery chart showing the NFP results for the last year. Following a fairly neutral Non-Farm Payrolls report, Michael Hewson takes a look at the sharp pull back in US stocks, as well as the potential gains for the euro on a lack of ECB action. Advert: Nonfarm Payroll Spread Betting, sponsored by FinancialSpreads.com. You can spread bet on the Nonfarm Payroll with Financial Spreads. As you probably know, the NFP data is normally released on the first Friday of the month, however, the spread betting market is not always open for very long. For the May 2014 release on Friday 6 June, the Financial Spreads and Capital Spreads markets only opened on Wednesday 4 June. However the markets for the June 2014 release opened two weeks before the official release date of Thursday 3 July. Investors should also note that whilst these firms offer a good number of 24 hour markets, the NFP market opens at 7am and closes at 9pm. On the day of the release though, the market will close for trading 15 minutes before the data comes out. So with the data due at 1.30pm, the market closes at 1.15pm. All times based on local UK time. As with a variety of financial markets, you can spread bet on the outcome of the latest US Nonfarm Payroll jobs report. Looking at a spread betting site like FinancialSpreads, you can see they are pricing the Nonfarm Payroll (May) market at 210 - 240, where 1 point is equivalent to 1,000 new jobs. On the expiry date for this 'May' market, i.e. when the May report is released, 06-Jul-14. When spread betting on the Nonfarm Payroll market you trade in £x per point. So, if you risked £2 per point and the NFP moves 38 points then there would be a difference to your profits (or losses) of £76. £2 per point x 38 points = £76. Then you could decide that you are going to buy a spread bet at 240 for a stake of £5 per point. With such a bet you make a profit of £5 for every point that the Nonfarm Payroll futures market increases above 240. Conversely, however, it also means that you will lose £5 for every point that the Nonfarm Payroll market moves lower than 240. Put another way, should you buy a spread bet then your P&L is calculated by taking the difference between the closing price of the market and the initial price you bought the market at. You then multiply that difference in price by your stake. So if the new Nonfarm Payroll report shows that 288,000 jobs had been added, as was the case when the April 2014 figure that was released on 2 May, the market would close at 288. Investing, whether by spread betting or otherwise, doesn't always go to plan. In this case, you had bet that more than 240,000 jobs would be added. Naturally, there may not be as many as that and the market could go down. Note - The Nonfarm Payroll price data shown above is used as an example only. Where Can I Find Live Prices and Charts for the Nonfarm Payroll? Naturally any firms offering the market will have live prices when you log on to their platform. With regards to the charts on the spread betting websites, the nonfarm market is only live for a few days before the release and it behaves like a futures market with a specific closing date. As such any charts will be fairly limited. Having said that, Bloomberg has a useful chart of historical results, see above. About the Nonfarm Payroll (NFP)? This is typically the economic indicator which impacts the global markets the most in a given month (i.e. non just the American markets). The NFP number represents the number of jobs added (or lost) in the US compared to the previous month. As the 'nonfarm' name suggests, the data covers details on the majority of paid workers in the US. Exceptions include those employees working in farming, charities, non-profit organisations, government and private household employees. What Does the Nonfarm Payroll Indicate? How many new jobs have been created and therefore it is used as a strong indicator of how the US economy is performing. Bloomberg has a useful chart showing the past numbers, see Bloomberg Nonfarm Payroll chart. The table below also shows the actual results vs the consensus forecast since 2007. Readers should note, if you can't see the NFP market listed on the platform then it might be because it's only available for a limited period before the nonfarms is released, see below. 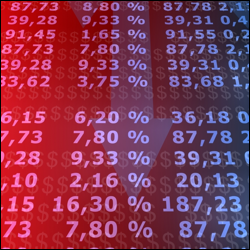 This guide to political spread betting reviews how to trade on the outcome of the UK General Election, which firms offer election spread betting markets, plus the latest news for... » read guide. Investors can now spread bet on the US nonfarm payrolls release. A number of firms have opened an NFP market so you can speculate on the key US employment figure... » read from top.